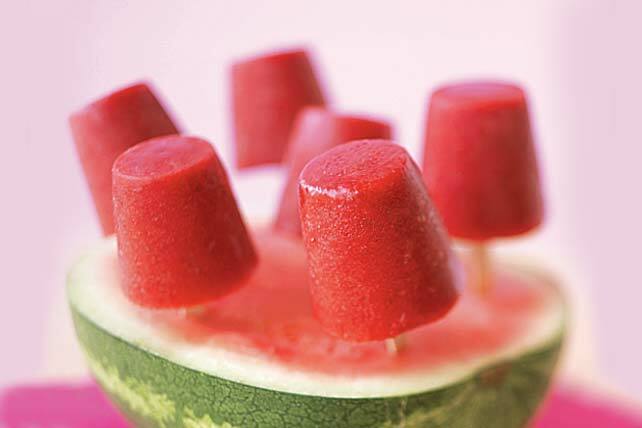 Don't sweat the weather when it's hot outside - just stir up some super cool snacks. 1. REMOVE stems from strawberries by pinching and twisting stems between 2 fingers or using a butter knife. 2. MEASURE drink mix using measuring cup, levelling with straight-edged table knife. 4. POUR fruit mixture evenly into 6 paper cups. 5. FREEZE 1 hr. Insert wooden pop stick into each cup. Freeze an additional 3 hr. or until firm. 6. PEEL off paper cups to serve. Let stand a few minutes at room temperature to soften slightly before serving. Makes 6 servings.